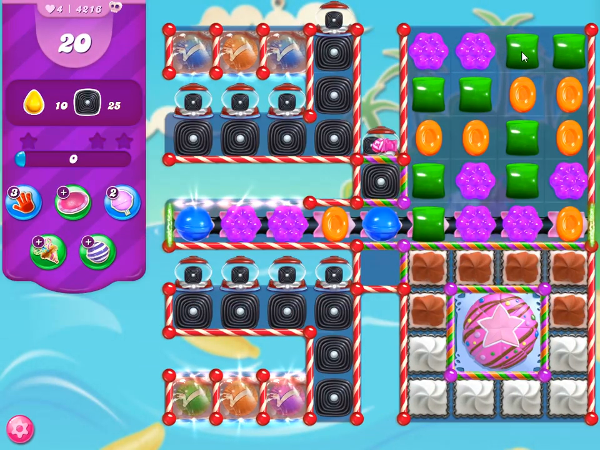 If there are fewer than 15 liquorice swirls on screen, then the board spawns up to 15 when possible. First break candy cane curls, icing blockers and liquorice swirls as many as you can. Then make special candies and combine special candies to break cake bomb, remaining candy cane curls, icing blockers, more liquorice swirls, lucky candies as it will give you yellow candies and to collect yellow candies to collect orders. Striped candies & wrapped candies will fall from candy cannon, use them to break more lucky candies, remaining liquorice swirls and to collect remaining yellow candies to collect remaining orders to complete the level.